There is an enormous amount of location data being generated by cell phones, wi-fi enabled devices, and gps devices every minute. Sense Networks, a company founded by Columbia University and MIT faculty members, is a company that mines this location data in real-time to discover behavioral patterns of mobile phone users. 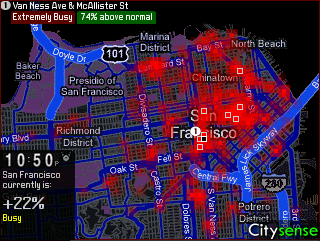 One simple mobile application that the company has produced is CitySense, which produces an activity "heat map" of a city, showing the user where all of the busiest locations are in real-time. "Citysense shows the overall activity level of [a] city, top activity hot spots, and places with unexpectedly high activity, all in real-time. Then it links to Yelp and Google to show what venues are operating at those locations." Sense Networks attributes 487,500 dimensions to every place in a city, thus identifying a unique and complex 'DNA' which describes it completely... Proprietary MVE (Minimum Volume Embedding) algorithms reduce the dimensionality of location and temporal data to 2 dimensions while retaining over 90% of the information. The company eventually plans to produce an application that learns the movement patterns of a mobile phone user over time, subsequently providing recommendations for places to visit when the user visits a new city. For example, if you like to visit ice-cream shops in your hometown, the application will automatically learn this behavior. When you go to visit another city in another state, the application can automatically "sense" and report to you where the most popular ice-cream shops are in that city based on location data from other ice-cream lovers. The application of this kind of technology to social networks and consumer-enriching applications is exciting, but the privacy implications can be frightening. Sense Networks has a special executive called the CPA (the "Chief Privacy Advocate") who deals with privacy concerns. Their philosophy is to give a user complete ownership over the data they choose to share, as well as a provision for the user to easily delete at any time the data they have already chosen to share. very nice information thanks for sharing it, and what about silica. Doing my research I found great books about Data mining. This books intends to bring together the most recent advances and applications of data mining research in the promising areas of medicine and biology, in real life applications, web applications etc. The readers will benefit from this books and consider it as an excellent way to keep pace with the vast and diverse advances of new research efforts.